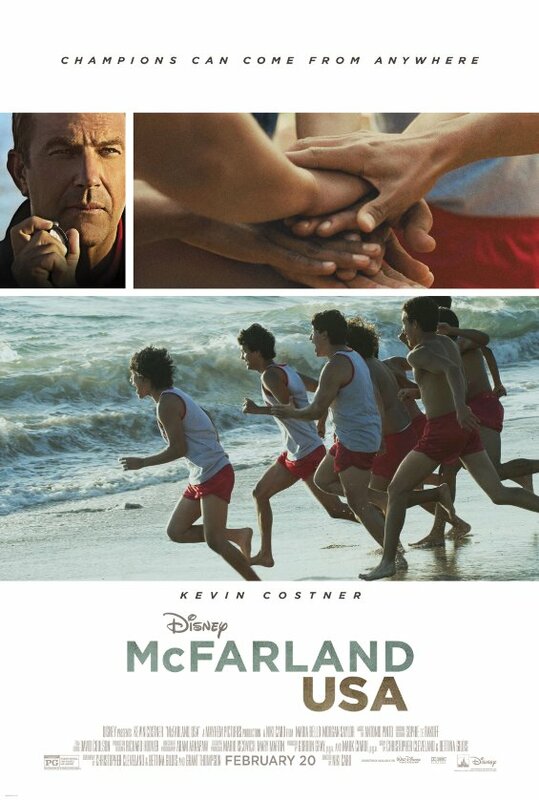 I can’t say that I’ve been looking forward to McFarland, USA, the latest true story sports drama by Disney. Don’t get me wrong, Disney has made some pretty solid (albeit cliche and by-the-books) sports dramas in the past 15 years, with Remember the Titans probably being the most remembered. McFarland is a film that is based on a true story about a high school cross country team in McFarland, California in the 1980’s. The film does have potential to be a very good film, but its a starring vehicle for Kevin Costner, and its also a PG-rated Disney sports film. You probably shouldn’t get your hopes up too high. Here’s my review of McFarland, USA. Kevin Costner plays Jim White, a former high school football coach whose fired and moves his family to the small town of McFarland, California, a town and a school that’s predominantly Mexican-American. He takes a job as the football coach at the high school, but is demoted to just a P.E. teacher. He decides that a good chunk of his students are very good runners, and decides to start a cross country team. The team is consisted of your average sports drama misfits (a kid with a past, the fat one, the cocky one, etc). The team is able to overcome obstacles that many would deem impossible, with the finale being the state championships in Los Angeles. The film was directed by Niki Caro, whose best known for directing the film North Country, as well as some other smaller features. The film was written by screenwriters who last wrote another Disney sports film Glory Road, which told the story of the Texas Western all-black basketball team in the 1960’s. That film did have its cliche and by-the-book moments that’s become expected in sports dramas, but it worked somehow. The acting was good, as well as the directing of the basketball sequences. McFarland, USA is a pretty lame and forgettable sports film, which is a bit of a shame since this is based on a true story, and the story itself is a very powerful and inspiring one. This film tries to convey that, but it is ultimately brought down by overly sappy moments and forgettable characters. Kevin Costner is alright in the role, but he’s miscast in the picture. I’m still not sure why Costner, an actor who hasn’t made a great film in about two decades, is still getting starring roles in big Hollywood films to this day. I’ve never really found the actor to be that interesting of an actor, but I feel that if you give him some material thats grittier and less sappy (similar to the past couple of Costner films I’ve reviewed, Draft Day, Black or White). This film falls into that category, as this has the making to be a really great film, but the PG rating, the fact that its Disney, and Kevin Costner’s presence make this film just an average and lame sports flick. Speaking of Disney, I feel that this story would be an incredible story for ESPN’s 30 for 30 (ESPN is apart of the Walt Disney Company). That film series has been mulling out some of the best sports documentaries of the past 6 years, and this story would be perfect for that series. If there’s one good thing that can come out of this film, it can be that more folks know about this story, and that ESPN could could consider doing a 30 for 30 on this. We also get some supporting performances from Maria Bello, who plays Costner’s wife in the film, and the actors who play the runners in the film aren’t half-bad, but the dialogue that they’re delivering in this film is pretty bad. There wasn’t particularly one bad performance per se, but there was one that was driving me nuts. It was Costner’s eldest daughter in the film, played by Morgan Saylor. You may not know that name, but you’ll recognize the face almost immediately, as she played the very whiny and annoying Dana Brody on the Showtime television series Homeland for three seasons, and her whiny performance was easily the worst part of that series that seems to have more negatives than positives (and yet I continue to still watch it). That performance annoyed me, but other than that, nothing else really bothered me. The cinematography was pretty, and the sense that the entire town was coming together to root for this team was nice. But I don’t really see myself recommending anybody go see McFarland. The film is supposed to come out in a few weeks, but if you felt that you really needed to see this film, I’d just wait till the DVD comes out or when it comes on HBO or whatever. McFarland, USA, compared to some of the more brilliant and off-beat sports films of the decade (primarily Bennett Miller’s last two films, Moneyball and Foxcatcher), is pretty lame in comparison. Granted, those films are masterpieces, and this is just a below-average Disney sports flick. If you have to go see one Disney film this year, I’d probably wait till the end of the year for that film that takes place in a galaxy far, far away….